Bobcat’s latest attachment innovation is the fully integrated Trimble 3D system for grading. Precision leveling that once required a full-size grader now can be accomplished by a skid steer or track loader. The skid steer/track loader revolution has reached its evolution stage. 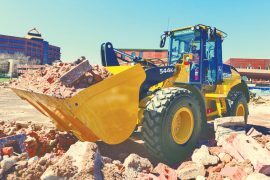 The industry-transforming machine has become a staple in everyone’s fleet, with only refinements now separating one generation of skid steer from another. Where the revolution still is playing out is in attachments. 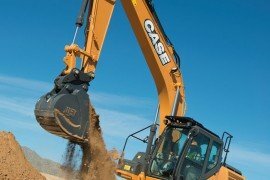 A quick aside: Is there a chance the skid steer or track loader will become a specialty machine over time, being called upon for just one or two tasks it handles particularly well? Not even a small chance, say OEMs. 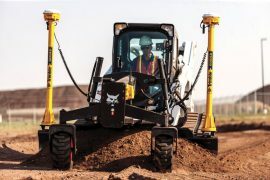 “What makes them great machines,” says Brent Coffey, Wacker Neuson’s product manager for loaders, “is that they can spin on a dime and operate in not a tremendous amount of space.” And the skid steer loader’s capability has been enhanced with the addition of dedicated tracks (as in a compact track loader) that spread the ground pressure in soft soil conditions and add stability, traction and pushing power. 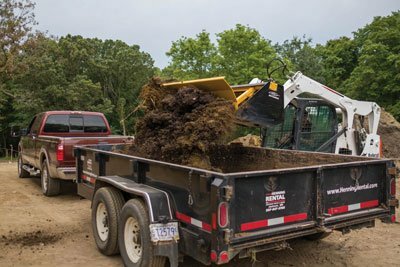 More to the point, the now-standard quick-attach system that can turn a skid steer pallet-mover into a skid steer auger machine also works on track loaders. The ISO-standard attachment system features a flat plate on the front of a skid steer. An operator slips the protruding upper lip of the plate under a corresponding overhang on an attachment. Then the plate is hydraulically rolled back, which brings the bottom part of the attachment into firm contact with the plate. Two pins drop into slots at the bottom of the attachment and — voila! — machine and attachment are joined. Even better, the pins can be hydraulically pushed into place through separate hoses dedicated to that function, which means an operator need not leave his seat to fasten a tool in place. Reversing the procedure detaches the tool. The non-engineering term for the whole process is pretty slick. No wonder hydraulic attachment systems are becoming de rigueur. 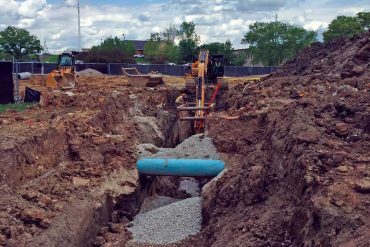 Some decades-old skid steers still trundling around jobsites may not have the universal attachment plates, but those machines are disappearing. And it’s true a few attachments — such as Bobcat’s forestry cutter — fit only one brand of skid steer for proprietary or safety reasons. But generally speaking, attachments today are universal … and their variety continues to grow. 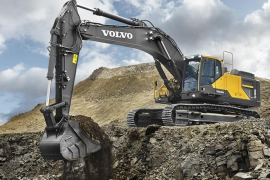 Commonplace are forks, buckets, blades and augers, but manufacturers also are building a lot of interesting grapples, a variety of long-tonged tools for scooping up or grabbing logs or concrete rubbish or landscaping rocks. 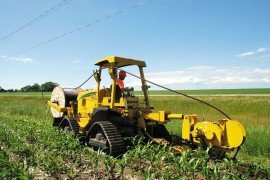 Zima says grapples are “very, very popular,” whereas Coffey calls Wacker Neuson grapples “very, very, very popular.” In short, compact equipment operators like these devices. Dig this awesome skid steer push-off bucket — a rear plate ejects material incrementally. The bucket is offered in three sizes, is self-cleaning and features a cycle time of less than two seconds. “We think it will innovate a lot of different industries,” says Chad Mohns, HitchDoc vice president, who credits his grandfather with inventing the device. The original model was sold to the Owatonna Mfg. Co. Years later, after the bucket went out of production and royalties from his invention dried up, his grandfather strolled into the family-owned business place and suggested HitchDoc resurrect the idea. So, the firm built one or two of the buckets for its own use, eventually wearing out the devices. “It always had been in the back of mind to bring the push-off bucket back to the market,” Mohns says. 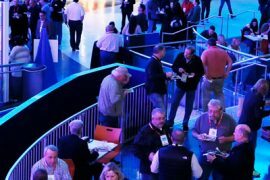 He and company colleagues built a prototype last year and introduced it at World of Concrete 2017. Mohns says visitors to the HitchDoc booth were “excited” by it. The new-model bucket was launched in March. Not new but still unusual is the hydraulic boring attachment marketed by McLaughlin, the underground tool specialist. Two models are designed for mounting on skid steers. 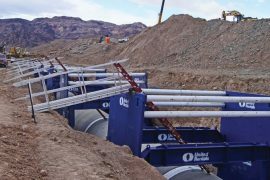 One utilizes a bracket welded on one side of a loader bucket with the hydraulic boring motor attached to the bracket with a pin connector. On the second model, the boring motor is mounted directly to a skid steer quick-attach plate. 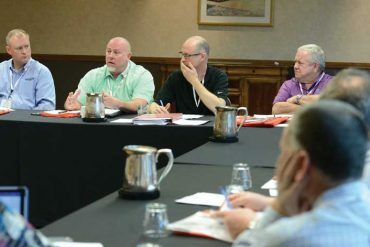 The welded-bracket-on-a-bucket configuration is the more popular, according to Philip Heath, a regional sales manager for McLaughlin. Skid steers must have a 9-gpm hydraulic fluid flow rate at 2,000 psi to lift and operate the boring attachments. “None of the skid steers have a problem with it,” says Heath. 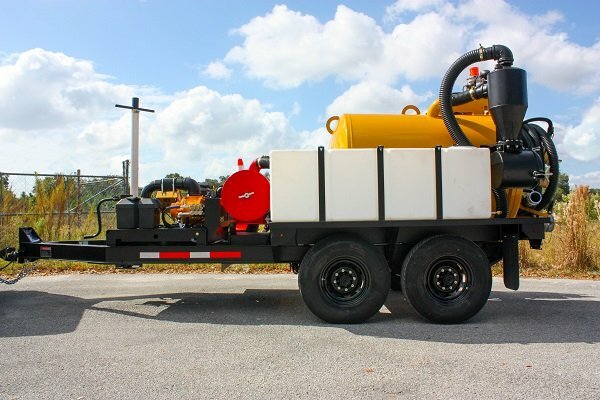 In addition, the company makes a small M5000 hydraulic machine that works from a pit like larger boring machines, but it can be powered by the auxiliary hydraulics of most skid steers/track loaders. 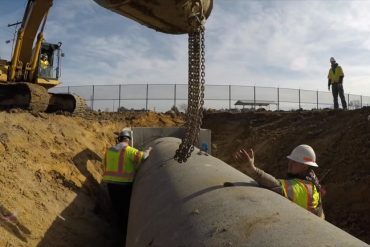 All of these burrowing devices are popular with municipal gas and water departments and contractors tunneling beneath driveways and roadways. 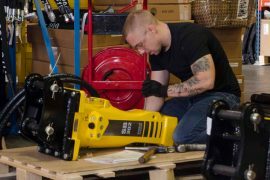 The fine folks out of Vacuworx (Tulsa, Okla.) offer the uniquely cool CM 3 Compact Modular Vacuum Lifting System. It’s the first vacuum lifting solution attachment of its kind, and the patent-pending CM 3 enables skid steers and track loaders to lift concrete slabs, steel plates and pipe up to 6,600 lbs. Operated hydraulically, the CM 3 can accommodate single or double pad configurations for a variety of material weights and sizes. Read more about attachments here.